Arguably the best backyard is one that is both beautiful and functional. Visual appeal is definitely important, but a yard that you can’t use—much less enjoy—could be considered a wasted investment. There are tons of great landscaping ideas on how to turn your outdoor space into an extension of your indoor living space without compromising aesthetic quality. Hardscapes are perhaps the best way to place a clear division between outdoor spaces without it looking tacky. Stamped concrete pavers, gravel walkways, red brick roads … using these materials to create a path between areas is as practical as it is functional. The separation also gives each area visual definition, which lends an overall organized—but not too structured—look to the yard. 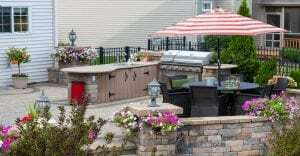 An outdoor kitchen is an ideal addition to any yard. As an extension of your indoor living space, it’s arguably one of the most functional landscaping ideas a homeowner can have. And if you’re fond of hosting outdoor parties and summer barbecues, it is extremely practical. It’s highly recommended that you use weather-resistant materials like stone and concrete when building your outdoor kitchen, and make sure there’s plenty of light—both natural and artificial—for your prep areas. It’s also important to situate your kitchen in a way that keeps everyone in the dining area upwind from smoke and fumes; this can ruin any great dinner party. You also don’t want the smoke getting into the house, so you’ll have to account for that when deciding where to put it. When in doubt, professional landscapers can help you pinpoint the best location that meets all these prerequisites. Here are some fabulous outdoor kitchen design ideas you should look into! Setting aside a public and/or recreational area in your yard is another way to boost functionality—especially if you have pets or kids. If you have the space for it, you can install play structures like a swing set, jungle gym, or sandbox in a region of your yard that is free of debris and hard structures. Invest in real or synthetic grass or shredded bark mulch for a softer, more forgiving play area. This will significantly reduce injuries. Investing in functional décor is a great way to boost your outdoor space’s functionality and visual appeal. For instance, some great landscaping ideas that fulfill both practical and visual conditions would be stone benches. They look gorgeous placed amongst greenery, along walkways, or as borders between areas. A fire pit is yet another practical addition—great for colder spring or autumn nights—that can look stunning in the right setting. If you need a place to relax, set aside an area of your yard and make it your dedicated “quiet” space—an area that promotes meditation, silent rumination, or just general undisturbed relaxation. It can be an outdoor living room, an actual meditation area, or just a small spot where you are untouched by the noise and pollution of the outside world. These quiet spaces can look quaint, rustic, otherworldly, or charmingly urban, depending on how you choose to decorate it. And if you have a stressful, overwhelming schedule, it’ll definitely serve its purpose. Turning something functional doesn’t necessarily detract from its visual appeal. If anything, it improves its overall value. If you enjoyed these landscaping ideas and are thinking of implementing them in your own backyard, give us a call! We’d love to help you achieve both form and function in your outdoor space.